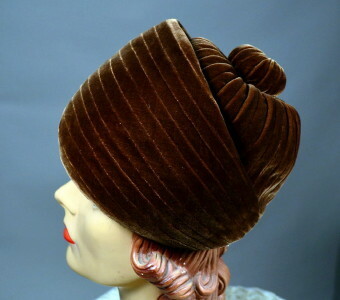 60's vintage GILBERT ORCEL toque hat. Cocoa brown inverted pintuck seamed velvet. Dome crown with wide rolled band front. Large self ball "button" at center back crown. Silk & mesh lining. Grosgrain inner band. Inner crown length, front to back - 7 1/4"
Inner crown width, measured side to side - 7"
Excellent condition. Shows only the slightest crush at velvet, nearly imperceptible.